NO FLOOD ZONE (X)!! 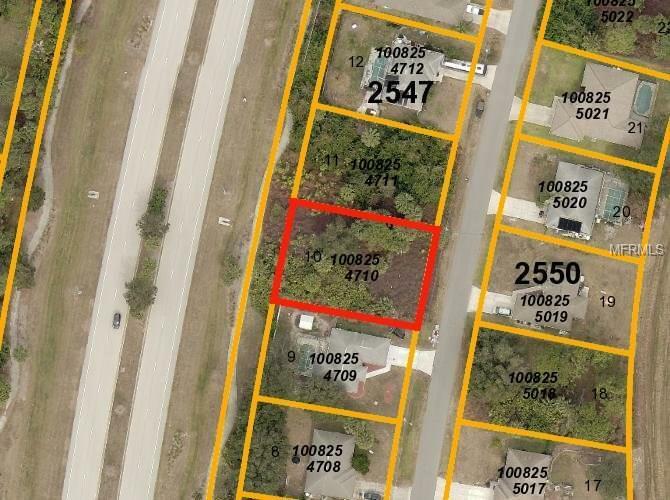 THIS IS ONE OF 2 LOTS FOR SALE - HERE IS YOUR CHANCE TO OWN BOTH VACANT LOTS UP TO A 1/2 ACRE LOCATED IN AN UPCOMING SECTION OF FAST-GROWING NORTH PORT!!! EACH LOT PRICED INDIVIDUALLY AT $9900. GREAT FOR SELF DIRECTED IRA'S, 401 K'S AND OTHER INVESTMENT PORTFOLIO'S. BE AT THE RAY'S BASEBALL STADIUM IN 10 MINUTES - PLUS - 2019 BRINGS THE NEW BRAVE'S STADIUM JUST 20 MINUTES AWAY. BEACH IS 20 TO 25 MINUTES AWAY. BUY NOW TO INVEST IN RISING LOT PRICES, OR BUILD AND WE CAN INTRODUCE YOU TO THE BEST LOCAL BUILDER'S IN TOWN. THIS IS A PERFECT LOCATION MINUTES FROM SCHOOLS, GOLF COURSES, PARKS, NEWER SHOPPING, RESTAURANTS AND MUCH MORE. ALSO SEE MLS# C7250732 FOR THE DETAIL'S ON THE ADDITIONAL PARCEL AVAILABLE FOR SALE.